In DeepSee MDX, a tuple expression can include more than one member expression from the same dimension. In most cases, the result is null, because in most cases, a record belongs to only one member. However, in DeepSee, a level can be based on a list value, which means that a given record can belong to multiple members. For example, the tuple (allerd.soy,allerd.wheat) represents all patients who are allergic to both soy and wheat. DeepSee finds the rows in the fact table that correspond to all the non-measure members used in the tuple expression. If the tuple expression includes a specific measure, DeepSee finds the value of that measure for each relevant row of the fact table. If the tuple expression does not include a specific measure, DeepSee uses the default measure (typically, %COUNT). DeepSee aggregates those values together, using the aggregation function specified for the measure. 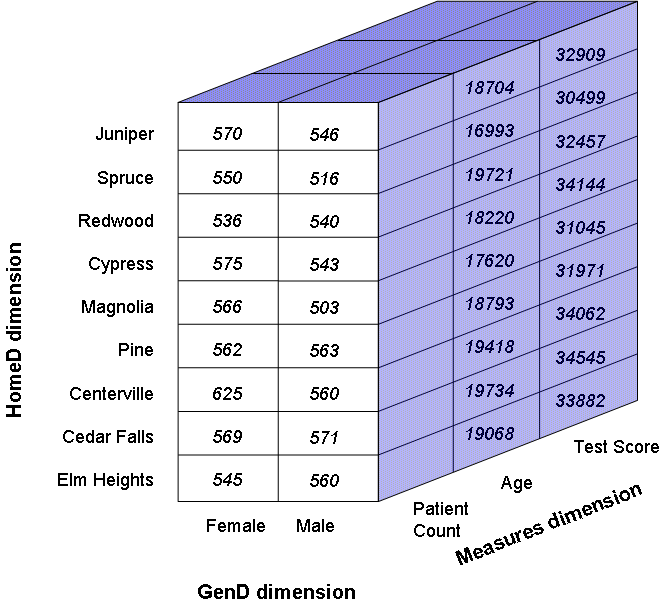 To determine the value of this tuple, DeepSee finds all the patients in the fact table that belong to the 32006 ZIP code, and whose favorite color is red, and who are allergic to dairy products. DeepSee then accesses the values for the Test Score measure for those patients and averages those values. To determine the value of this tuple, DeepSee counts the patients who are allergic to both soy and to wheat. 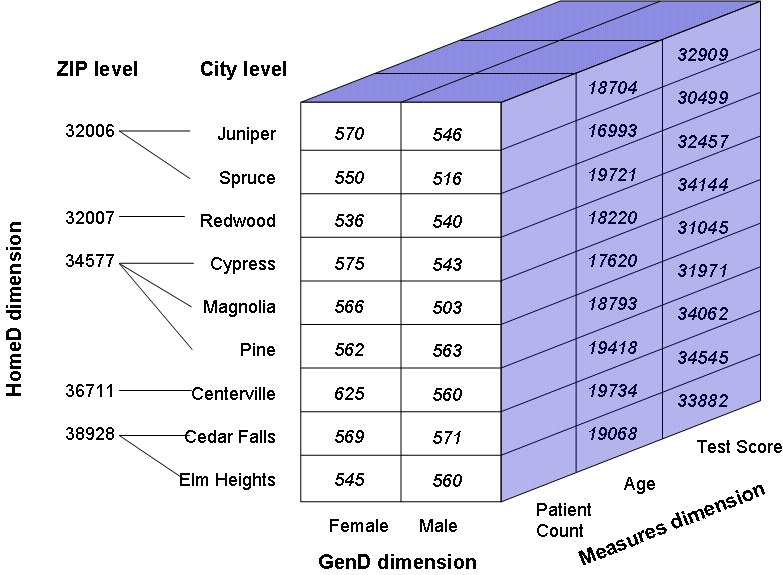 To determine the value of this tuple, DeepSee counts the patients whose home city is Juniper and whose home city is Centerville. The value of this tuple is null, because each patient has one home city. For this query, DeepSee finds the relevant tuples in the cube and obtains their values. For example, the first tuple is (homed. [cedar falls],gend.female,measures.[%COUNT]). The value of this tuple is 569. For this query, DeepSee finds the relevant tuples of the cube and obtains their values. When a query uses, for example, the Sales Quarter level, DeepSee uses the appropriate part of this axis and accesses the requested tuples.